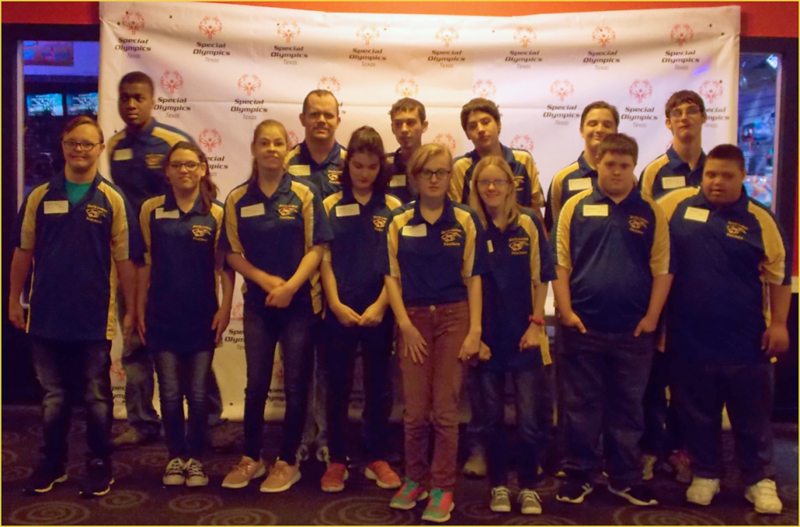 Members of North Lamar’s Special Olympics Bowling team, beginning the front row, are Charlie Wilkerson, Makayla Crawford, Helena Dyck, Dani Baker, Sarah Eudy, Avery Tawater, Christopher Allen and Randy Dowell. In back are Kevin Duncan, Mike Thomas, Gavin Rosson, Marcus Sanchez, Lucus McCurry-Porter and Gary Cady. North Lamar’s Special Olympics Bowling team competed in Area at the AMF Lanes in Garland on November 9. Gold medal winners were Lucas Porter, Avery Tawater and Dani Baker. Silver winners were Christopher Allen, Gary Cady and Kevin Duncan and bronze medal winners were Randy Dowell, Helena Dyck, and Makayla Crawford. Placing fourth were Mike Thomas, Charlie Wilkerson, and Gavin Rosson. Fifth place winners were Sarah Eudy and Marcus Sanchez.